Produced by Elvis Time Publications. "Caugt In A Trap" contains pictures from a photographer called Laurens van Houten. The pictures are taken during the unusual August / September 1973 Las Vegas engagement. There are several pictures from the September 3rd 1973 Closing Show. 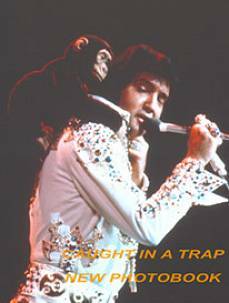 On this show Elvis entered stage riding on Lamar Fikes back carrying a pluche monkey himself. Glen D. Hardin has written the introduction. The book is hardback and contains 135 pictures (80 in colours). All on 128 pages. Price is 50 US dollars (incl. shipping). The second foreword is written by Arjan Deelen and oddly enough, illustrated by a photo of Laurens van Houten... Deelen's text floats into van Houten's recollections, which are not accredited to the writer, believe it or not. Mr. van Houten was assigned to photograph Elvis in Las Vegas in 1973, travelling with a Dutch group of fans. Before arriving in Vegas, they visited Memphis and were let in on the grounds of Graceland by Elvis' uncle Vester. They must have enjoyed this and it's also evident by pictures taken at the entrance and by the swimming pool in the back yard. The jumpsuits that Elvis used for these particular shows were extremely stylish, especially the "Black Spanish Flowers" suit. All pictures are great, but it's the photos from the closing show that takes the cake. Not only for being highly unusual, but also because they're close-ups. Elvis looks great, though a slight paunch is a sign of his increasing weight problem, a battle we all know he ultimately lost. Also note Elvis' ring-studded fingers. It's great to see what bass player Emory Gordy looked like; a hippie! [Actually, I see a slight resemblance to Elvis reviewer Mark Schraven!] Emory played bass on 'Burning Love,' recorded in Hollywood, March 1972 and filled the gap between Jerry Scheff and Duke Bardwell during live performances in 1973. Well, what can I say? This is a sensational book and if you're even remotely interested in Elvis in the 70's, it belongs in your collection. But Laurens: you don't "make" photographs, you take 'em! On a scale from 1 to 5, I give CAUGHT IN A TRAP a 5.